We offer the Whole Leaf Organic Black tea from famous organic tea gardens like Arya Tea Estate in Darjeeling and Belseri in Assam. We use either First Flush or Second Flush teas which have their unique aroma and taste. The Whole Leaf teas are meant to be used 2-3 times over 6-8 hours. 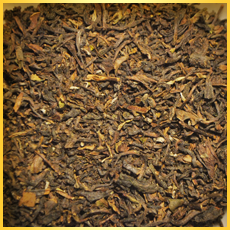 Darjeeling Black Supreme: These are available in 100 Gms, 50 Gems, and 20 pyramid teabag packs. The Whole Leaf teas require a lot of space for unfurling/ expansion during brewing, and normal teabags don't allow such space. Therefore, we use pyramid shaped tea bags. Black Elixir: These are available in 100 Gms and 50 Gms packs. These teas are from an organic tea estate in Nepal that is very close to Darjeeling and shares the same climate. The character of these teas is very similar to that of Darjeeling teas. Assam Black Supreme: These are available in 100 Gms and 50 Gms packs. Black teas are also available in many flavors of spices, fruits and herbs as per the details are given in 'Flavored Teas' section. You can also buy these black teas online, also available in many flavors of fruits, spices, and herbs. Black tea is the most popular tea worldwide, but it does not have as many antioxidants as the other types of teas and it contains the most caffeine. Having said so, black teas vary a lot in taste and health benefits based upon their grade, seed variety, and time of the year when it is produced. Full leaf teas offer a good combination of taste, aroma and health benefits. Some of the best black teas are called SFTGFOP (Super Fine Tippy Golden Flowery Orange Pekoe) with Clonal or Chinese seeds. To produce Black tea, the tea leaves are withered, fully oxidized (fermented) and then dried. The fermentation process causes the leaf color to darken, which gives it its black color. During refinements, the valuable 'full leaves' are broken down into fannings and dust. The whole leaves are removed from lower quality tea dust and fannings. Unfortunately, much of the tea that we are exposed to is made from these leftovers. The quality goes down from 'full leaves' to 'dust'. How Did Black Tea Get Its Name? Black tea goes through full fermentation in which the leaf color darkens to give it its black color. Hence the name was given to it! Black Tea, which undergoes complex fermentation, evokes a strong scent and has the heaviest concentration of caffeine. Black tea is stronger in flavor than green tea, white tea or oolong tea. The accepted methods of grading tea relate to the grading of Black tea only. In evaluating the quality of tea, the tea experts give consideration to the variety of the tea, the region where it was grown, the stage of picking off the leaves and the tea manufacturing process (Orthodox or CTC). Thus the origin of the tea plays a big part in its quality. For example, Fine Darjeeling usually has lighter liquor than other black teas, from a light reddish color to bright gold. It is one of the most famous in the world and considered by many to be the best, which is why it is referred to as the Champagne of teas. Ceylon teas from Sri Lanka are probably closest to what most people think of when they think of tea: reddish-brown liquor; brisk, and a full flavor. Dust-D - This is the lowest grade in the classification of Black tea. Actually, it consists of small pieces of tea leaves and tea dust. Fanning- This consists mainly of pieces of tea leaves. It is a low grade. BOP- Broken Orange Pekoe. This consists of small tea leaves or pieces of large Leaves. It is considered a medium grading for the classification of tea leaves. OP - Orange Pekoe. This consists of large, whole tea leaves picked without the flower bud of the tea plant. FOP - Flowery Orange Pekoe These are the whole tea leaves together with the flowering tea plant. In addition to the five main categories of tea, there are two further important qualities or traits and these are 'Golden' where gold hues occur in the tea leaves evidencing their quality and 'Tippy' which signifies an abundance of young tea buds. These teas are anti-viral, anti-bacterial, anti-depressant, boost immunity against cancer and other diseases. They also control bad cholesterol and artery clogging. You can buy these Black Darjeeling and Assam organic whole leaf teas at our Buy Black Tea Online.